Students and supervisors from the Education Adequacy Project appeared before the Connecticut Supreme Court on September 28, 2017. 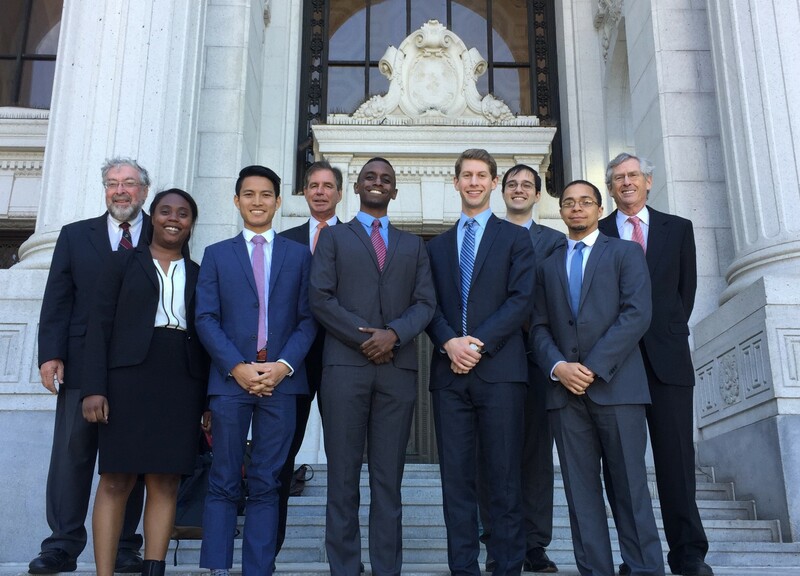 Students and faculty from the Education Adequacy Project (EAP) appeared before the Connecticut Supreme Court today to defend the clinic’s historic 2016 trial court victory in CCJEF v. Rell, which found that the state was “defaulting on its constitutional duty” to educate its most disadvantaged children. EAP has represented the Connecticut Coalition for Justice in Education Funding (CCJEF) since drafting the coalition’s bylaws in 2003 and filing the original CCJEF complaint in 2005. The coalition is composed of parents, teachers, students, and local education leaders who say that Connecticut’s irrational and inequitable funding system deprives public schoolchildren of their fundamental right to an adequate education. During the 2016 trial, the coalition pointed to the academic achievement gap between the state’s poorest children and its most affluent: by some measures, the very worst in the nation. On recent state math tests, fewer than one-in-ten Bridgeport students earned scores indicating college or career readiness, a result replicated across other low-wealth districts, according to the clinic. Following extensive appellate briefing and public outreach—including legislative testimony before the CT General Assembly’s Education Committee earlier this year—EAP students assisted clinical professor Joseph Moodhe in presenting legal arguments they had spent years honing. Applauding Moodhe’s oral advocacy, CCJEF’s principal consultant Jim Finley reflected on this seminal moment in the case. “The outcome of CCJEF v. Rell will determine whether the Connecticut Constitution truly champions education equity and adequacy for all K-12 public school students in our state,” Finley said. This is the second time the Court has heard oral arguments in the clinic’s case. Back in 2010, the Court held in a 4-3 decision that the Connecticut Constitution guarantees an enforceable right to adequate educational opportunities. “Through our briefing and oral arguments here today, we hope to reaffirm the importance of an adequate education for underserved children, families, and communities as it was first recognized by the plurality in 2010,” said clinic student director Sesenu Woldemariam ’19.